One of my favorite parts of Christmas is hanging all our handmade stockings on the mantle. Here's a few of my favorites that I have come across this season. 1. Bebe Sniklefritz - I love the Christmas tree stocking that has an adorable pink minky dot cuff. And the black & white Damask stocking is beautiful! 2. Pie Dough Productions - The elf boot shaped stockings are so cute! And what little girl wouldn't look adorable in the super full holiday swirl skirt? Act fast...it's only $20! 3. xo elle - Find a variety of stockings in this shop, my favorite being the pea green corduroy stocking. 4. Mushroom Delight - I adore this mini pink polka dot elf stocking! 5. The Material Girl - This crafter is all about recycling & reinventing. The stocking that was created using a vintage tablecloth is very unique. The mini stocking gift card holder is cute, too! 6. Mod Dot Textiles - The stocking collection includes those made using bold, modern fabrics, including the fun & funky black & white dots! 7. 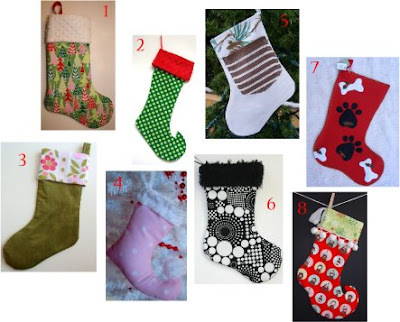 Maggie O'Riley's - Anyone who creates pet stockings is a winner in my book! Check out all the printed stockings featuring various winter scenes. 8. Downstairs Designs - I love the stocking trimmed with pom poms! Sock monkeys + pom poms = perfection! *Make your own EXPANDABLE Christmas stocking!